Carmelo Garofalo is Manager for the Fraud & Security Intelligence Practice at SAS Italy. 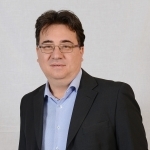 Carmelo has got extensive technical and business knowledge in the field of Fraud & Security Management, that allows him to ask people the right questions in order to extract insights that can help find the best solutions for customers. He is responsible for developing propositions in Security & Fraud solutions across markets and his main specialties are on Big data, analytics and Enterprise Architecture.